So, after the previous attempt to get my big Jessie (Scottish for wimp) horse past the kid goats the following day I was determined we would have another try. The tactics were – speed and leg yields! We set off on our hack, roads were quieter so this was good start and ten minutes later we were approaching the huge scary feck off alien monsters from outer space! Time to change up a gear. Approximately 30 yards away he was already snorting, head up with a slightly elevated gait…. kick on! Into trot, a very big bouncing trot with snorting. Cue left leg yield! Damn it, should’ve put a martingale on…. kick on! One thing in our favour this time was the fact that the kids were not in clear view. I could see them behind the tall hedge but this gave me a better chance to getting him actually past the hedge. And past the hedge we went!! It wasn’t pretty but he did it! Lots of pats and words of encouragement later I felt like we’d overcome a wee hurdle. Now all we had to do was walk back haha! He did walk back, with less snorting and carry on. Maybe the thought of getting back to the safety of his stable away from these horse eating monsters was the motivating factor! We will keep going this route until he calms down and stops trying to put me in the ditch, which is rather deep by the way with a nice thorny hedge along side it.. NO thanks pal! Okay we’re not talking the human variety here, more the four legged cute kind. As I was feeling a bit under the weather today I decided on a ride out instead of working in the arena (much less effort for me lol) So we set off down the drive. We’ve been this route four or five times. I always do this with Finlay when we move yards, go the same route for a week until he relaxes and feels more secure. So I didn’t think we would have any problems, how wrong was I? The road seemed busier this morning, we met quite a few cars and not all of them slowing down either! Its a quiet road but can be a fast road too. Ten minutes away from the yard there is a small garden centre, we’ve been past it a few times and admittedly he is spooked by the geese (they also have a few animals) But I’ve always got him past safely. Today however the kid goats were in full few twenty yards away. And that’s as far as we got! I tried all the tricks in the book but he was not going to walk past the goats. His heart was thumping so hard I could feel it. Eventually I got him to stand then I asked him to walk on which he did then before he decided it wasn’t going any further I turned him around and we walked back. It may seem like I gave in but I knew there was no way I would get him past the goats so the only option was that I would make the decision when we turned around, not him. You’ll never win a fight with half ton of horse, so picking your battles and how you negotiate the issue is the only option. So we will keep hacking out to the garden centre until he feels brave enough to walk past. This may take a few days or a few weeks it doesn’t matter how long it takes the important thing is that Finlay learns there is nothing to be scared of. Hello wordpress world, there have been a few changes in my little world of late. The most monumental was my youngest son starting primary school. I was a tad anxious about A starting school but a week in and so far so good. It took him such a long time to settle into the nursery routine I was concerned he may find school difficult. I know its early days but Im really happy and he seems very happy too! Seeing him dressed in his school uniform, shirt and tie, makes me burst with pride and tear in my eye. My baby is growing up too fast. The other big change was, not quite as momentous as the first but actually more stressful! Ten days ago I took the decision to move yards. After 6 months of trying to accommodate other people, watching my horse become more and more neurotic and the increased yard politics, I couldn’t stay there a day longer. Ive been thinking of moving for some time originally hoping to rent a small yard myself. It quickly became apparent that this option was just about impossible. So, after looking at a couple of yards where DIY was available I picked one. The following day I told the yard owner I was leaving in three days. End of!! Moving day was Saturday 17th, with the help of my very good friend, it went with out a hitch! that was the first good omen. Arriving at our new home during a torrential down pour ( I was on my third jacket by this time) we were greeted by the yard owner Denise. Denise owns the yard but most of it is rented by a professional showjumper and his partner where they produce youngsters for competition. They also have their own horses plus schooling liveries (people who pay them to work their horses) The pro’s horses are like the F1 of the horse world. Me and Finlay are more the RAC Rally haha! 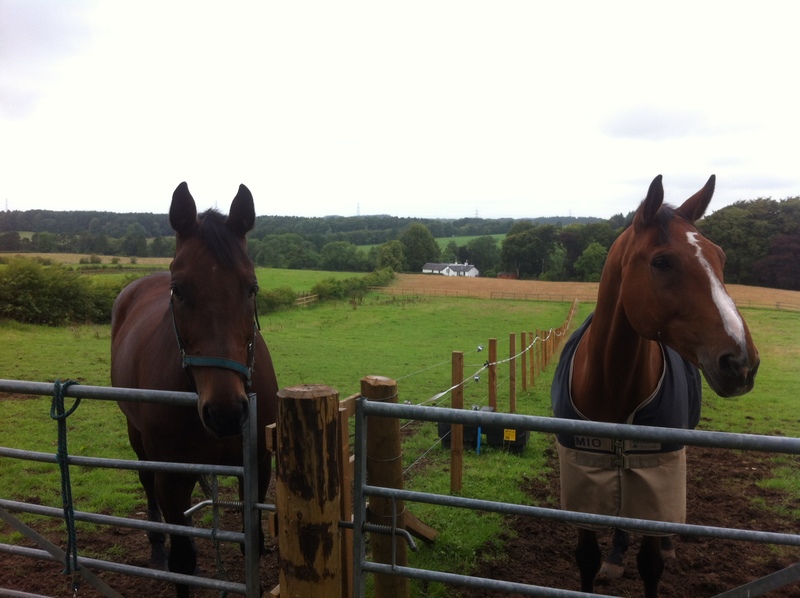 Denise uses a couple of stables for livery horses and I am lucky to be one! Everyone appears to be friendly and helpful, a really laid back atmosphere! With in an hour of being in his new stable Finlay was already calmer. I really couldn’t believe what I was seeing, this horse who had become so upset in his previous stable where even grooming him had become impossible was now completely chilled out!! Five days on and he’s just getting better and better! He now doesn’t bother when his neighbour goes out leaving him, he doesn’t barge the door or chew constantly. He has his own paddock next to his stable neighbour and is now happily turnout out everyday! Life has been busy this summer. The good weather seemed to make time pass quicker, the summer holidays are nearly over and my youngest son will start is first year of school. Im not sure he fully understands the concept of school. Like doing as you are told, for one. My youngest son seems to think he’s the boss of the world right now, this may pose a problem in the class room. I have a feeling the next couple fo months are going to be challenging. He doesn’t have behavioural problems as such, just controlling his emotions can be hard for him. They never seem to be far from the surface. Like today to example, after spilling the contents of the dogs food bowl he was asked to pick it up and stop playing football in the kitchen. This resulted in him throwing the ball at me then crying. I promptly took him to the hallway and sat him on the step where he was to sit until he apologised. Turning my back on the raspberry he blew I went back into the kitchen. These outbursts are not a daily occurrence by any means but it does worry me. How is he going to cope with a more structured day? He will have a classroom assistant and all of his friends from pre school will be in his class. I just hope he’s okay. I feel much more protective of him that I did my eldest son. He has a different character though, took everything in his stride. The youngest one is a different kettle of fish all together. Im praying he settles into his new routine. As a single parent life can be draining , Im sure it is for couples too, but when there is no one else to just run his bath, read the story, put him to bed, make breakfast, play/entertain all day, do the shopping, teach to ride a bike, play tennis, read, write, play knights castles dungeons dragons football hot wheels, cook, clean, wash…. blah blah blah… you get my point. My eldest has been helping a bit more, well I say helping. What I mean is playing video games with his little brother! Whilst I don’t really condone this it does give me time for myself. And time to ride my saviour, my therapy, my horse Finlay. Where would I be without him… okay Id have money, Id have time to go shopping (not food) Id have time to see friends, money for a holiday haircut new clothes…. But he’s worth it. So, summer is nearly over and I’m eagerly awaiting Autumn, my favourite time of year. The nights getting cooler, log fires, changing colours. 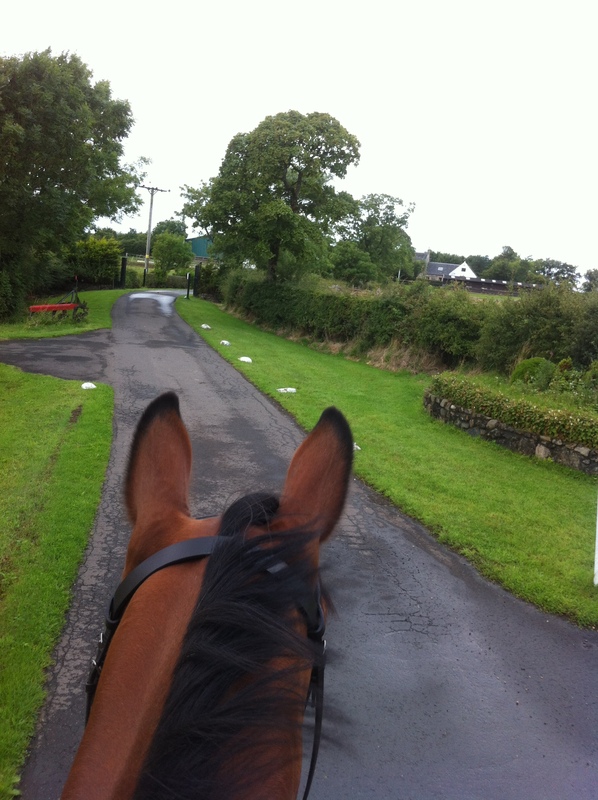 A fresher feeling in the air.. not to mention (to all horse owners) no flies! Yippee, no flies or cleggs! Yes, Im looking forward to Autumn! Oh and the magic mentioned in a previous post? Well that turned out to be a con after all, the bracelet however may actually work! I still have pain but not as intense and Im generally more positive! Reverse Psychology or Just Reverse?